Guns. Huge, freakin' massive guns. Maybe built into a mountain or perched high up a hill, maybe even partially dug into the hill iteslf and fires missles, giant molten balls of metal, or maybe just energy blasts of hyper charged plasma on some far city. That's what I imagined. I've probably been listening to too much news about North Korea, but anyway, that was the inspiration. I knew as I was drawing that I would not be able to get it quite as I wanted to. I didn't have a ruler (was using a spare pencil as a straight edge), I knew the perspective would probably be a bit off and also that I wanted people in it, perhaps soldiers or a top General and his attendant standing very close to the camera, looking off into the distance with stern expressions. I thought they would be done best drawn on a different layer, and I wasn't in front of my light table, so I couldn't easily manage that right then. Also, I was under a bit of time pressure. This one took about 50 minutes. I guess I was imagining this could be a propaganda poster of sorts, complete with a flag background behind the guns, the human element (people visible somewhere), and maybe some interesting lettering in a foriegn language and bold font saying who knows what. So now that I look at it and think about what I intended, I'm wondering if I should give it a go, try to finish it as I initailly imagined it. Having said all that, it worked out pretty well. The inking is quite good. I did my best to get clean, non sketchy lines, but also allowed them to be rough-ish, and it works. I like the sooty ends of the gun barrels. 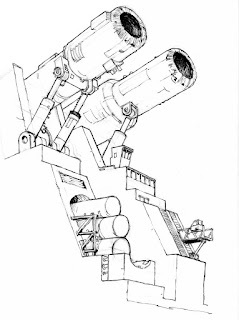 I like the design of the place, though I know it needs more stairways, more observation platforms and enclosed command towers. It could use some other vehicles like tanks or jeeps or cranes around. I do like the lift on the bottom right with it's cockpit that is a bit like one on a crane. I also like the ammo cartridges on the bottom left. You can see how they might get loaded into the thing. I'm pleased that I've been able to draw it in such a way that you can feel how it might be to really be there. It's the perfect angle you've chosen (and the perspective looks great, what are you talking about?). I like the clean look to it. With so many rounded surfaces, the whole thing looks very smooth and almost soft. I also like the sooty ends and the loadable cartridges. It's a strangely violent bit of subject matter but VERY well designed! So you didn't really like it, huh?! You're tough. I've gotta start making up negative stuff, just to keep you on your toes! Yeah? So where's that new submission, bub? Huh? Huh?!! Where the heck is it?! !